A historic 1930’s Smoky Mountain lodge in Gatlinburg Tennessee. Two blocks off the Parkway, an easy walk downtown. Only 3 miles from the Smoky Mountain National Park, and 5 miles from Pigeon Forge. Minutes from Horseback Riding, Golfing, Skiing, Rafting, Ober Gatlinburg, and Dollywood. 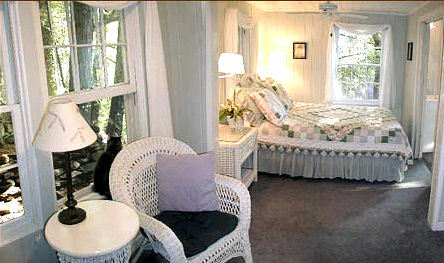 We have five guest rooms, all have private baths, cable TV, VCR, premium linens, and botanical bath products. We have five guest rooms for your lodging needs. All with private baths, cable TV, VCRs, and complementary wireless internet. All have premium linens, down or synthetic pillows, and botanical bath products; mini-suites also have bathrobes and DVD players. The entire Lodge has been modernized with central heat, central air conditioning, and modern plumbing (yes, we have great water pressure). Gatlinburg Lodging with smoky mountain ambiance! This and other Gatlinburg Bed and Breakfast Inns can be found here online in The Register.